A US guided missile destroyer collided Sunday with an oil tanker in the Persian Gulf, the US Navy said in a statement. No one was injured. 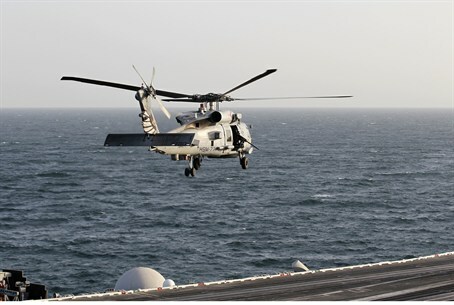 The USS Porter was on a scheduled deployment to the U.S. Fifth Fleet, based in Bahrain, when it collided with the M/V Otowasan oil tanker at approximately 1:00 a.m. local time. It is not clear what caused the collision with M/V Otowasan, which sails under the flag of Panama. The USS Porter was damaged in the incident, and an investigation has been launched, a Navy spokesperson said. An Iranian parliamentary delegation met with “Arab and other parliamentary unions” this past April on the sidelines of an Inter-Parliamentary Union (IPU) this past April in Panama City. Iran has repeatedly threatened to close the Strait of Hormuz in response to tightened economic sanctions aimed at pressuring Tehran to stop its nuclear development activities. About 40 percent of the world's oil commerce is routed through the Strait, located at the entrance to the Persian Gulf and controlled by Iran. Due to the growing Iranian threats to close the Strait, the United Arab Emirates quietly built a new oil export terminal on the Gulf of Oman. UAE oil officials and executives from oil majors such as ExxonMobil, Shell and Total gathered on the eastern coast of the country in February to celebrate the opening of an alternative route for up to 75 percent of UAE's exports.